James' Jetsam - Your Cruise Expert: Does all inclusive = Chav cruisers? I added some news recently to our forums at cruises.co.uk about how MSC have a deal on at the moment for an all inclusive drinks package. One of the comments made about this was that MSC were obviously lowering there standards and that there would would be lots of horror stories "of people being ejected at ports and numerous cruisers lost at sea." On first reading it I thought it was a little harsh but on further thought it did have me thinking, when you offer something like an all inclusive drinks package does it attract the 'wrong sort' to the cruise? Now I'm sure this may raise blood pressures on both sides of the fence so I'm going to try and stay impartial and look at the arguments fairly. Cruising always has always been, and to a greater extent still is, considered a higher class holiday. However, in recent years with more cruise ships being built cruising has become much more 'mass market' with the cruise lines being forced to drop their prices to fill the ships. Whilst for the vast majority of people this is a good thing, with a fantastic cruise holiday now becoming affordable, the knock on effect has meant certain standards have slipped or to be more diplomatic changed. Cruise ships are no longer as formal as they once were, indeed some cruise lines like NCL have done away with formal nights all together. Most of them also offer a much wider range of things to do onboard than they once did, from waterslides to rock climbing walls to ice bars. It's clear to everyone that the cruise industry is changing but are all the changes a good thing? 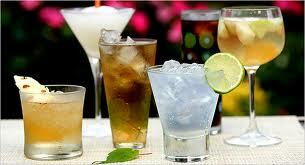 As in for instance all inclusive drinks packages. There are several cruise lines trialling this at the moment but will making your cruise experience all inclusive make it better? I suppose the easy answer is that there's no way to tell until it's fully implemented except for the fact that several cruise lines already offer this and have done for years. I can think of at least two off the top of my head offering all inclusive drinks. The ultra luxury six star cruise line Regent and then Thomson cruises offer it as well. In terms of price, onboard experience, clientele and style these two cruise lines couldn't be further from each other and yet both have been offering drinks packages for years without, and I quote again "people being ejected at ports and numerous cruisers lost at sea." But what do you think? My own thoughts are that an all inclusive cruise, rather than encouraging drunkenness, just lets people relax and not have to worry about their bill at the end of the cruise; I can't imagine anyone getting absolutely wasted every single night. So would you prefer the all inclusive option or do you like things the way they are?